As many of you know, we rarely keep anything that we sell. It's not that we don't want to, but this is how we earn a living and support ourselves. In fact, we have never kept a piece of furniture that we've reupholstered! 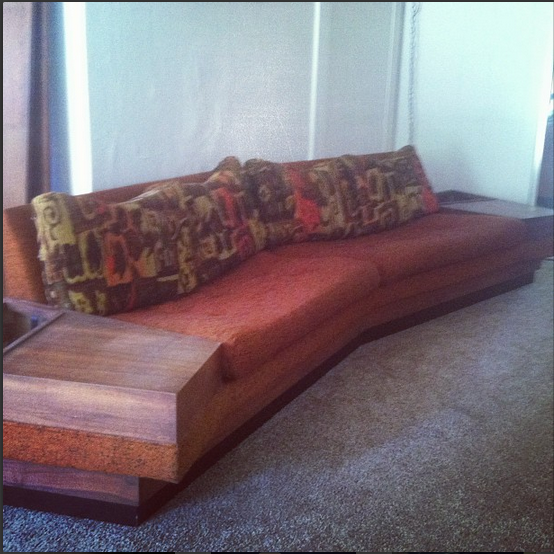 Currently we have a terrible sofa that we bought off craigslist when we moved to Portland. It served us well, but the springs were broken, and the feather pillows offered no support at all. A month ago, Chris went to a sale in Washington state, and found a few amazing pieces for great prices. Once he got it home, I knew that it had to be ours. It was too cool and amazing to let it go! The timing was also right, this summer has been great for us and it seemed like if we were going to keep something, now was the time. This sofa was designed by Adrian Pearsall, he's known for his uniquely shaped furniture. Con's: The webbing was completely stretched out, the foam dehydrated and gross, and it was hard to tell if we were going to like the feel of the sofa. The planter inset were missing, but Chris was certain he could easily make those. The yardage needed for this sofa was at least 12 yards. When would we find the time to upholster this? Space storage also made it very difficult. This is our front room where we work on most of our projects and house in-progress pieces. This was currently taking up a large portion! In the end, it was a pretty easy decision, but as I've said before, choosing which fabric to use is always the hardest part. Chris likes to keep things as original as possible. Adian Pearsall is known for his bold fabric choices, so Chris felt that this would be essential. He wanted a bright orange or turquoise. While I love both of these colors and we use them quite often. I like them in a smaller scale, a side chair or loveseat. Not a 10 foot sofa! I wanted a neutral oatmeal linen, soft gray, or anything in the neutral realm that would go nicely with the wood end tables. We talked about it often and I tried to convince him, he stayed his course, but finally the perfect fabric choose us! 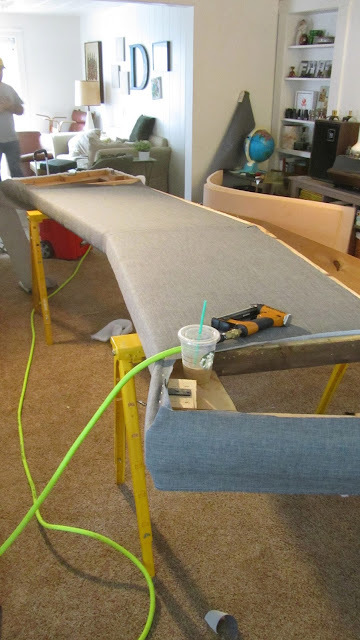 Since this sofa needed so much fabric, we knew we needed to find the fabric at Fabric Depot. It's a local superstore here in Portland, they send out mailings with 35% off coupons. 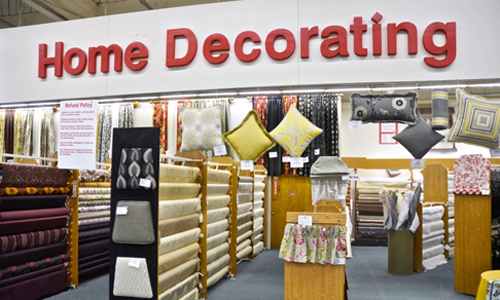 This has helped us numerous times get great deals on upholstery fabric. The tough part is finding the right fabric and once you do, will they have enough of it. They buy overstock of upholstery fabric and often cannot get more of it. After having the sofa for a few weeks, we decided the best plan of attack would be for me to start making the cushions first. There are six, so that would take some time. Then once that was finished we could carve out some time to strip off the old fabric and re-upholster it. I headed off to Fabric Depot, with a budget of retail $25 a yard being my max (before using my coupon). I love how they have the upholstery fabric sorted by color, starting in the creams I meandered my way through. I tend to be drawn toward textural solids, currently they have some beautiful ones, but they are $39 a yard. Way out of our price range. Once in the grays, I see something I haven't seen before. It's a heather gray, just the right shade for.....*wait for it*.... $11.99!!! I couldn't believe it!! I still can't, to be honest. It's smooth, strong, sturdy and beautiful. It is polyester, but I've often found that it's easier to work with and will last a long time. Natural fibers are much more expensive, plus they stretch and pill more easily. Now do they have enough of it... and they did! In fact, they even had an untouched roll in back stock - 15 yards! I quickly grabbed it up and am seriously considering going back and buying more for future projects (to sell). Now to start! I quickly sewed the six cushions. It took about two full mornings, roughly 8 hours. Which was much faster than normal! We decided to make these the same way as the original which was different from my normal boxed cushion way. I really like how they turned out and will probably use this method much more often! Then Chris and I found a day where we could remove all of the fabric and staples together. It always goes much faster as a team! Here's some pictures of this *fun* process. Lots of weird colored foam left and mysterious powders pouring out of the sofa. Because of the weight of the sofa, we found it helpful to disassemble it as much as possible. The next day, Chris re-webbed the sofa with new webbing. 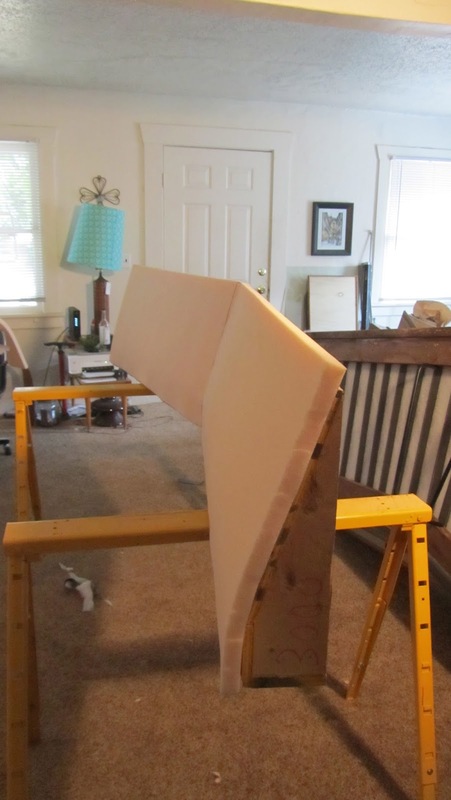 Then, I sanded the frame to get off the remaining residue of the old foam. Beautiful. You two do amazing work, glad to hear that everything worked out for this project. I had to write when I saw how you work IN your space. If you can dismantle an old sofa with all the dirt and mess, I can't make any more excuses about not having enough room for a project. It also helps for people to see how much work is involved in changing a mess into a useful, beautiful piece once again. The type of webbing we used can be seen at this link.